Over five years ago, the then President Iajuddin Ahmed held a series of talks with political parties to break the political stalemate developed over the appointment of a chief adviser to the caretaker government, which assumed office after the BNP-led government's tenure expired. Former chief justice KM Hasan was supposed to assume the office of the chief adviser. But political controversies surrounded him. The then opposition parties led by Awami League vehemently opposed his appointment as the chief of the caretaker government, labeling him “loyal to BNP”. Amid growing political crises and street violence, Justice Hasan declined to take office of the chief adviser on October 27, 2006 and sent a letter to the then president. The next day, Iajuddin held talks with the then BNP Secretary General Abdul Mannan Bhuiyan and AL General Secretary Abdul Jalil to discuss the appointment of the chief adviser. The two senior BNP and AL leaders from October 5 had been holding several rounds of talks to break the political stalemate. But they failed to succeed. However, at the meeting with Bhuiyan and Jalil, the president offered himself as the chief adviser. The sudden proposal made the opposition camp surprised and they outright rejected it. On October 29, the president held a day long talk with leaders of AL, BNP, Jatiya Party and Jamaat-e-Islami to resolve the issue. In the talks, AL proposed former chief justice Mahmudul Amin Chowdhury as the adviser. But BNP and Jamaat opposed the proposal. As a result, the concerned parties failed to reach a consensus. In the evening, Iajuddin Ahmed assumed the office of the chief adviser of the caretaker government, paying no heed to other alternatives of picking another chief adviser. 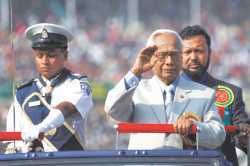 The then president assumed office on advice of his party BNP that selected him president. At that time, the BNP-led four party alliance was not sincere about resolving the political crisis and they did not hesitate to abuse the office of the president for their petty partisan gains. Iajuddin himself failed to uphold the dignity of the presidency. As a result, the political situation worsened. And amid growing political unrest, Iajuddin was forced to step down from the office of the chief adviser and a state of emergency was declared on January 11, 2007. People's memories are not so weak that they cannot remember the events following the declaration of the state of emergency. Now, people fear that history will repeat itself in the next parliamentary polls. This time, the issues are more critical. The AL-led government has unilaterally cancelled the caretaker government system five months ago. Meanwhile, the BNP has unequivocally announced that they will not participate in the next parliamentary polls without restoration of the caretaker government system. The AL keeps rejecting the opposition demand for reinstating the caretaker government that could have assumed office on expiry of the tenure of the AL-led government and could cooperate with the Election Commission (EC) in holding the next parliamentary polls in a free and fair manner. The political stalemate over the caretaker government continues to mount. Amidst all these, the formation of the new EC on expiry of the current one's tenure in early February appears to be crucial right now. The country may be heading towards a political storm if the government goes ahead with its unilateral decision to appoint the election commissioners. The BNP has long been demanding that the new EC be formed in consultation with all political parties. Otherwise, they will not accept the appointments. In the wake of prevailing political situation, Iajuddin's successor, President Zillur Rahman was advised by the AL-led government to hold talks with political parties on the constituency of the new EC. Accordingly, Zillur Rahman has announced to hold talks with the parties from December 22 seeking their recommendations on it. But the fate of the talks looks gloomy. The BNP has already rejected joining the dialogue as the party wants to first discuss the caretaker government issue. If the BNP does not respond to the president's invitation to the talks, some other political parties will follow the suit. So, the talks will be fizzled out. If that happens, the president will then appoint a chief election commissioner and other election commissioners to constitute the new EC. He will so do on advice of Prime Minister Sheikh Hasina. In fact, the president has no option but to follow the advice of the prime minister. On his own, he can only appoint the prime minister and the chief justice. So, it is now obvious that the AL-led government has come up with a very clever move to use the president's office right now to open talks with the political parties. Regardless of the outcome of the talks, the government and the ruling AL will try to portray it as “a positive political gesture” and will blast the opposition parties for boycotting the talks with the president. But in the context of the pervasive confrontational culture in politics, the truth is different. One may question the AL-led government's sincerity to resolve the current political stalemate. Also, one may easily term the president's talks with parties as an “eye-wash” and a “political stunt” of the government. If the government sincerely wants to do something better regarding the formation of the EC, it should follow the constitutional provision to enact a law on the appointment of the election commissioners. The law has not been formulated since the constitution was framed in 1972. In absence of the law, successive governments appointed people of their choices as CECs and other election commissioners triggering political controversy. Prime Minister Sheikh Hasina and some of her cabinet colleagues over the last two years have pledged on several occasions that the government will enact the law. But till date, the government has yet to form an independent search committee for appointing a new EC. The search committee would recommend three names for each position. And then a 15-member Business Advisory Committee (BAC) of the parliament, led by the speaker, would finalise the list, and the president would appoint them from the list. The current EC believes, with the proposals made into law, political consensus on appointments can be reached as the prime minister, leader of the opposition in parliament, and senior leaders of the ruling and opposition parties are members of BAC. Although the formation of widely acceptable EC will not minimise the growing political stalemate over the caretaker government-issue, enactment of the law may contribute largely to demonstrating the government's sincerity on this issue. But the government seems to have opted for doing petty politics in the name of holding talks using the office of the president who has basically no power to do anything. Zillur Raham, since his election to the presidency by the ruling AL in 2009, did nothing significant politically that could drum up people's confidence in the president's latest effort to forge a political consensus over the formation of the new EC. A president who only acts on the advice of the prime minister can do nothing to break the political stalemate. If a president wants to do something, s/he must have integrity and courage to uphold the office of the presidency above the petty partisan line. Therefore, it is almost certain that President Zillur Rahman's move to talks with the political parties on the formation of the new EC will not be able to yield positive results. Rather his office may face a risk of falling into political controversy. Besides, in the pervasive confrontational culture in politics and growing animosities between the two archrival camps, it is almost impossible to forge any consensus on any major issue through dialogue. The past records of dialogue at least do not encourage people to become hopeful. Is there then really no chance to break the political stalemate? Yes, there is. In that case, both the rival camps—AL and BNP—must stop doing petty partisan politics. They need to demonstrate their political will to resolve the crisis. They need to hold talks within themselves. If holding talks openly is not possible, they should keep discussing informally. They should not keep the door closed. Even the BNP should join the talks initiated by President Zillur Rahman and place their recommendations on the formation of EC and also on restoration of the caretaker government system. And the AL needs to reassess its stance on the formation of the EC and the caretaker government.